The Sony LA-FZB2 B4 Lens to FZ Mount Adapter for F5 & F55 allows you to mount most 2/3" prism block B4-mount lenses to a Sony F5/F55 single sensor camera, while maintaining the same angle of view the lens exhibits on a 2/3" prism block camera. The adapter provides the communication between the lens and the camera, passing metadata. 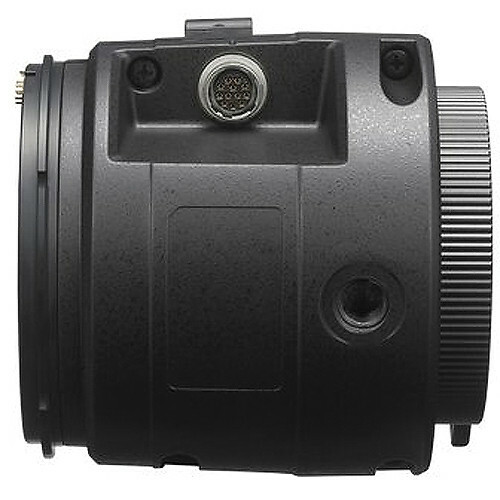 The adapter allows your camera to display lens data information, such as focus, zoom, and iris in the viewfinder. The adapter supports chromatic aberration compensation using ALAC-2 for select lenses, and you can assign the "RET" button allowing you to call functions such as Expanded Focus and last clip review. The LA-FZB2 includes 15mm rods, lens support bracket, and lens support knob. Compatible with most B4-mount lenses. Maintains lens field of view. 12-pin Hirose connector provides bidirectional communication between lens and camera. Displays lens data: focus, zoom, and iris on the viewfinder. Lens metadata data is recorded, real-time, onto compressed and/or RAW digital stream. The adapter supports H&V Automatic Chromatic Aberration Compensation (ALAC-2) for lenses in camera database. The system incorporates the same RCP/MSU operation system as current HDC Series cameras. Box Dimensions (LxWxH) 7.9 x 7.1 x 6.8"
I wish to mount a Fujinon DigiPower (box lens and Canon Digisuper (box) lens to two Sony F65RS/VF cameras, shooting 4K (RAW). Will this adapter work seamlessly, not work, or require other Third Party modification? Will this adapter also work with the F3 (as Alister Chapman once suggested) and the newer FS7? Unfortunately, no it will not work. According to Sony, The LA-FZB1 and LA-FZB2 adapters are only supported on the PMW-F5 and PMW-F55. There are no plans to support these adapters on the PXW-FX7 or PMW-F3.